Church Bingo! Often Chruches and other organizations strive for new ways to help raise money for their needs. Ever try a Bingo fundraiser? or incorporate the trendy "basket bingo" Where instead of a cash prize a basket full of mystery goodies is given away and proceed's are collected for your cause. A unique format and a fun way to increase profits for you and excitement among players. 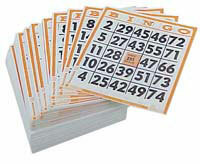 This game is played on special folded and sealed bingo cards and is a great addition to any bingo program. Before your regular session begins, call 48 numbers and post them on your Bonanza Bingo flashboard and continue to play your regular game. 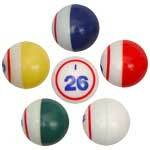 Sell Bonanza Bingo cards before the last game of the night and close sales. A player with coverall wins the jackpot prize. If there is no winner with the 48 numbers posted, call the 49th, 50th, etc., until there's a winner for the consolation prize. 12" diameter by 16" long by 20" tall. Holds approximately 5000 1" by 2" tickets. 9" diameter by 12" long by 10" tall. Holds approximately 2500 1" by 2" tickets. Large Double Ticket Raffle Tickets. The back of this double ticket roll has a place for name, address and phone number and a security strip to prevent fraud. 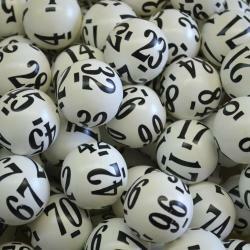 Use as a raffle ticket for any event with a drawing. 1000 Double Tickets Per Roll. Each Double Ticket is four inches by two inches. Each half is 2 inches by 2 inches with the same number on both parts, scored in the center for easy separation. 25 different color sheets per book. A fundraising reverse raffle is one where you don't want to win. Give a free ticket to everyone attending a regular organization meeting or special event. Tell them they are automatically included in the drawing for a special prize. If they don't want to be eligible for the prize, they can "sell" their ticket for $1 to $10 - depending on your attendees. Why would they want to get rid of their ticket? Consider prize options/activities that can be completed during the event itself such as .... singing a song standing on a table; wearing a silly hat or mask; having their face painted; wearing a funny costume; or ????? Be creative! You will find very few spoil-sports who won't go along. If nothing else, they will "sell" their ticket to keep from looking foolish. 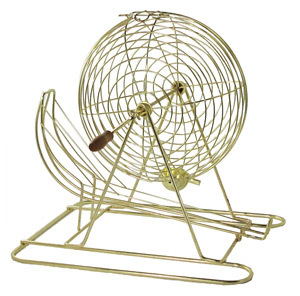 All ticket stubs are placed in a hat or other container from which one "lucky" number is drawn. 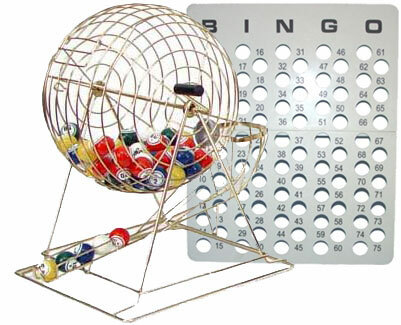 This is the smallest cage that uses FULL SIZE Bingo Balls. In many cases this is a better choice that the BC-50. With everything about this set being larger, it becomes easier for very young and very old to handle the balls and read the ball numbers. 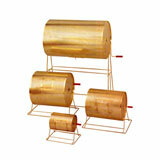 Overall the BC-75 stands 16 inches tall - front of back it is 17" and side to side about 15 1/2". This is perfect for retirement homes, senior centers, schools or anywhere else where you want both quality and a great price. 5 Color Set where each letter in BINGO is a different color.